Which sub-400 cc sportbike is right for you? After last week's review of the 2015 Yamaha YZF-R3, I've spent a lot of time answering questions comparing it to the Honda CBR300R, Kawasaki Ninja 300, and KTM RC390. I touched on it briefly in the review, but the more I've thought about it and talked to readers about it, the more I've come to realize there really isn't a clear winner. I can't just choose one and say, "This is the bike everyone should buy." I spent what felt like a year putting the specs into a nice chart down below for easy comparison (so you better read it), but beyond the specs, I broke down my thoughts about the bikes by category. The 2015 KTM RC390. KTM photo. While it may stand to reason that all four of these options should be relatively similar, my six-foot frame says otherwise. I found the Honda and Yamaha to be incredibly comfortable, but not so with the Kawasaki. The Honda and Yamaha also felt more solid and of a higher quality, where the Kawasaki felt a little cheap (it doesn't help that the engine has to spin up quite high to find power). The main thing that holds me back in comparing these bikes is that I've only ridden the three Japanese bikes. KTM doesn't believe people read the internet, so they haven't yet offered me a chance to ride or even sit on the RC390. But KTMs are known for being so "race ready" that they forget to make any effort to insulate riders from engine vibrations, which can make for a jarring ride (a month borrowing a buddy's Duke 690 confirmed this). Pair that with KTM's love for making seats out of wood, and I feel pretty comfortable in predicting that the Katoom is probably less comfortable than the Honda or Yamaha, especially on the freeway. 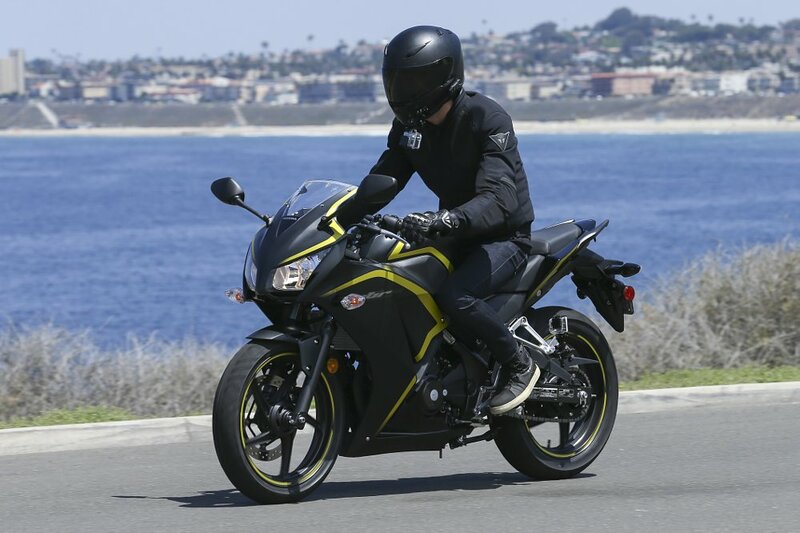 The 2015 Honda CBR300R. Honda photo. The Honda and KTM come with nicer radial tires, while the Kawasaki and Yamaha are back in the dark ages of bias ply. Many buyers won't mind upgrading, but if you're looking to buy something and ride it stock, this is a big win for the Honda. The tires on the Yamaha actually weren't too terrible, but the ones on the Kawasaki would definitely be changed ASAP, if it found its way into my garage permanently. This is a tough one to call without having ridden the KTM, but both the Honda and the Yamaha handle excellently. Despite being given a fairly dainty and budget fork, the Honda just works and works well. I spent a day flogging one around the Streets of Willow track and had an absolute blast, though the small fork did flex a bit under the harsh conditions. The bigger fork on the Yamaha helped keep it feeling slightly more planted and rigid under heavy braking or at high speeds, but both are about as good as it gets for street riding. The KTM's higher spec WP unit should best both, but it is really only necessary if you plan to track the thing a bunch (which you definitely should). It should come as no surprise that the KTM's 373 cc single cylinder, with its displacement advantage, is the king of the hill when it comes to power. Compared to the smallest engine (the Honda's little 286 cc single), it makes a whopping 33 percent more horsepower and 25 percent more torque. The interesting number here is the Kawasaki's low torque figure, which is why the Ninja will feel like the slowest to new riders who aren't used to chasing power in the higher end of the rev range. Despite the Honda's unimpressive horsepower number on paper, its single makes that power at much lower RPMs than the other Japanese bikes, which means it feels great in real-world riding conditions. The Yamaha's added displacement means that, even though it's a twin, it has enough power down low to keep you from having to chase it too much. The 2015 Kawasaki Ninja 300. Kawasaki photo. The Honda's single is the clear winner when it comes to fuel economy. With an average fuel consumption of 71 mpg, it trounces the competition. The twins in the Yamaha and Kawasaki both return a reported 56 mpg, while the KTM's single "only" gets 50 mpg. While my first instinct was to believe that the KTM would have higher maintenance costs than the Japanese competition, it turns out it's the Kawasaki that has the highest maintenance costs (assuming you scrupulously follow the user manual). Although its service intervals are longer at 7,600 miles, the requirement for a valve check at each service interval negates the benefits. The KTM actually isn't terrible, with 4,700 miles between services and 9,300 between valve checks. In the end, the Yamaha's 26,600-mile intervals between valve checks bests the rest by a solid margin, making it the cheapest to maintain. Obviously, all of the options here are well priced. I actually expected the KTM to come in quite a bit higher, but at only $200 more than the Ninja (with ABS), the price is really impressive, given the higher spec suspension and brakes. The Yamaha's instrument panel really impressed me and rivals that of bikes two and three times the price, easily besting the other options here. For being the cheapest option, the Honda's meter is actually pretty extensive and comes with a nice, clear display. The overall fit and finish of both the Yamaha and the Honda feel much nicer than their price tags would suggest. Honestly, it's completely up to you. If I were looking for a track toy or canyon carver, the KTM seems like a no-brainer. If the race class you want to compete in limits you to 300 cc, the Kawasaki is the best option. The Honda is best for new riders looking for something fun for the street and for whom the total money spent is paramount. The Yamaha feels like the best all-rounder, given its comfort advantages over the KTM and power advantages over the rest, but the lack of an ABS option will keep many buyers away. Personally, it's hard for me to pick a winner, especially since I have unanswered questions about the KTM. (I'm very curious about the engine vibrations.) I was very impressed with the R3 after the launch and expected to find the CBR300R loaner in my garage a little disappointing in comparison, when I got back home. To my surprise, I'm still a big fan of the Honda. I think I would still go with the R3, but I wouldn't fault anyone for sticking with Big Red. This is a good problem to have. For many years, this was a class of one that saw no development or innovation. Now, the manufacturers are one-upping each other almost yearly and the choices are really interesting. For those of you who've made a purchase, why did you choose the one you did? For those of you leaning towards picking up one of these bikes, which one do you think you'll go with?